Another week, another Lush review. What else is new? 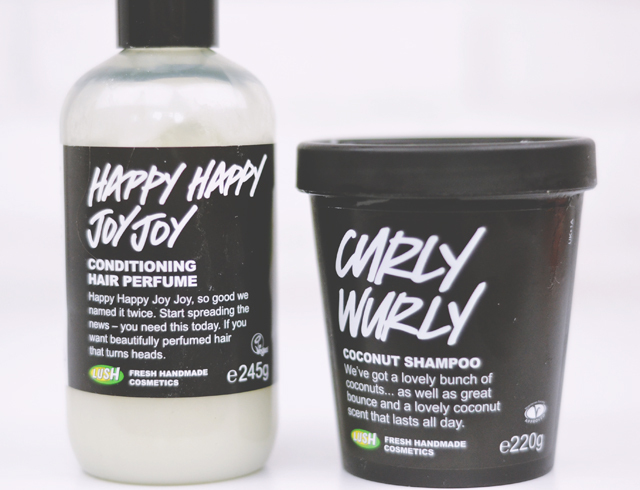 Sticking with my latest desire for haircare, I've taken on Curly Wurly coconut shampoo and Happy Happy Joy Joy conditioning hair perfume. Although I straighten it to death, my hair is naturally curly. Very curly. Stupidly curly. 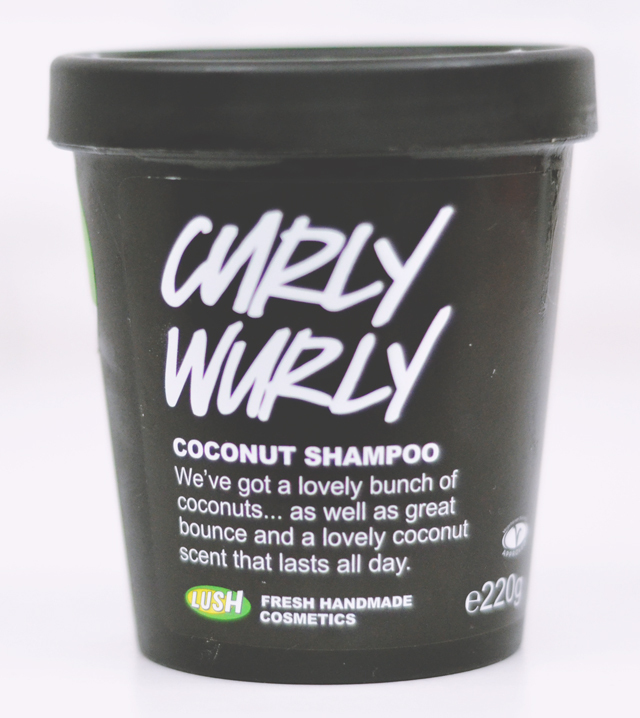 So I thought Curly Wurly would be perfect for me- it aims to keep hair moisturised and define curls. Let me start by saying that it smells incredible! A really rich coconut with a hint of lemon zest. Generally speaking, I'm not a huge fan of coconut scents so this is a big plus. The shampoo is sold in a classic black pot which, as I've said before, is slightly irritating as it means water collects inside when you reach in to scoop up some product, but redeems itself in going towards a free face mask. Interestingly, the consistency of this shampoo is almost like a stiff jelly and in between washes it tends to solidify. It also has a very unusual texture due to the chunky coconut flakes. I find this shampoo doesn't lather too well but wetting it slightly and rubbing it firmly before application helps. However, the chunks make it feel quite unpleasant in my hair, especially since it's a pale brown shade. There's no nice way of saying this- it feels a litle like rubbing vomit in my hair. It's also very difficult to rinse out. No matter how thorough I try to be, I still find I'm picking out coconut flakes for hours afterwards. However, I will admit that it makes my hair insanely shiny, which is a huge plus as I have such dry, frizzy hair. 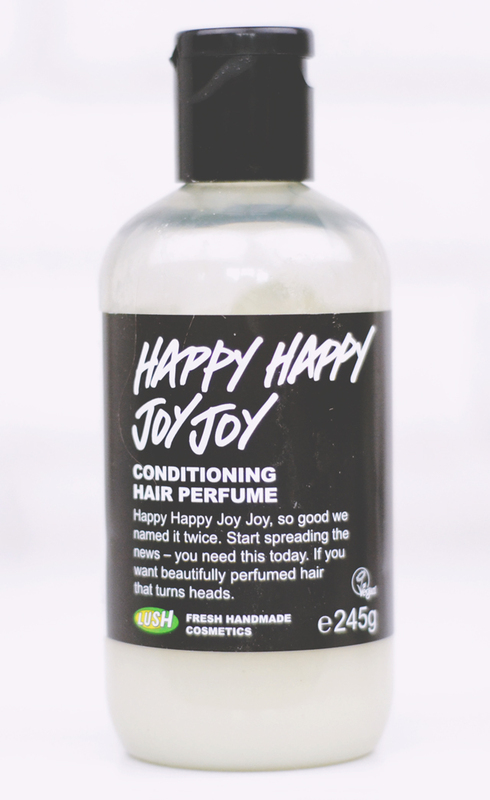 HAPPY HAPPY JOY JOY CONDITIONING HAIR PERFUME This is an interesting product because, rather than being labelled as conditioner, it's called "conditioning hair perfume" and is therefore priced much more highly than Lush's other conditioners... double the price, in fact! Let's not kid ourselves though- it's just a conditioner that smells nice. I tend to find bottles are more convenient for shower products, although it is a shame that they don't go towards the recycling bonus. I do wish Lush would create one for bottles too. Unlike other conditioners, however, Happy Happy Joy Joy has a much smoother, slightly thicker consistency which means it applies like a dream. The scent is a heavy floral mix of neroli, orange flower and rosewood, and is noticeable for hours after use. My hair feels nourished and moisturised and looks much shinier than usual. I do love this product but, if I'm completely honest, I'm not sure it justifies such a price hike compared to other conditioners. It's wonderful, yes, but so are the others, and I can't see a reason for this to be ranked more highly. I won't be buying it again, purely for the fact that I can buy conditioners equally as good for half the price. I've not tried any of the Lush hair products because I'm usually quite put off by the price! I don't know if I'd like that coconut shampoo either it's very strange! I wash my hair as little as I can, so it doesn't work out too much for me- a tub of shampoo can last about 2-3 months. If I used them more regularly, I'd be spending a large percentage of my wages on them haha! 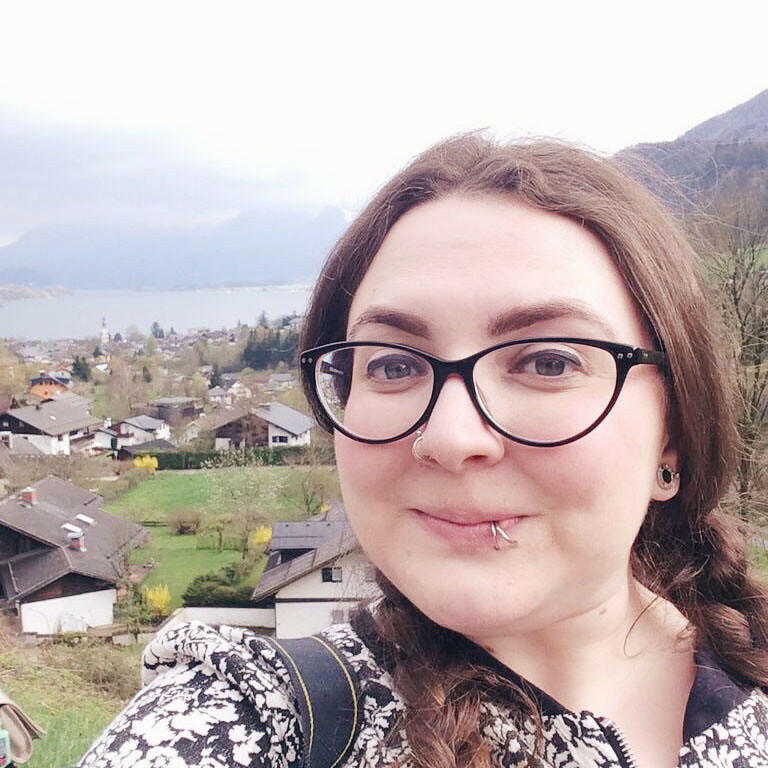 Ooh, these are two products I've actually had my eye on (as well as Big and Veganese) so it's really good to read a review from someone who didn't love them! Vomit shampoo sounds particularly horrible. Bleurgh. I'm glad to read your review of Happy Happy Joy Joy as it's a product I've been wanting to try but have been put off by the huge price tag and not being sure if it's any better than the American Cream I usually use. I don't think I'll bother if it's just paying for the scent! I really wouldn't recommend it. Maybe ask them if you can have a sample- Lush are normally pretty good for that. I'd always choose American Cream over this one though! Curly Wurly sounds right up my street but this review says otherwise haha! Coconut scented is always good to me, but I'm not so sure about the clumsiness - thick hair probs! I really love the Curly Wurly for my crazy curls. The coconut isn't a problem if you brush it through - I tend to do this with my conditioner, but I just move that back to the shampoo stage!